This listing is for a box of two new USA made adapters. If you need a set of 4, select a quantity of 2. Please note: If you are going from a larger bolt pattern to a much smaller pattern or centerb.. This listing is for a box of two new USA made adapters. If you need a set of 4, select a quantity of 2. Please note: If you are going from a larger bolt pattern to a much smaller pattern or centerbore, your adapter could have a step. Contact us if you need more information before ordering. IMPORTANT: Please double check you are ordering the correct item before you place your order. Tire Shop Supplies will ship the item listed, and cannot be held responsible if you order the wrong part. Please contact us to verify fitment if unsure. 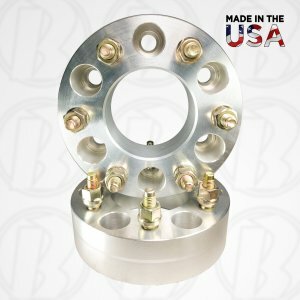 Becase these are custom adapters, we may call you for additional information to ensure a correct fit. Custom adapters are not returnable. -Largest Bolt Pattern: IMPORTANT! Set this option to the same as the vehicle or wheel pattern, whichever is greater. These adapters do not change lug count. If you need to change lug count, click here.